Once the Nightscout app is open, Open Preferences. Your uploader screen may not look the same as this. 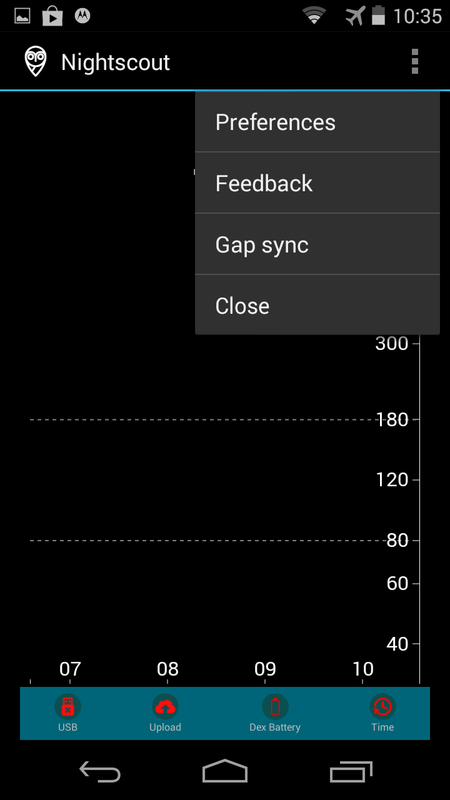 The Preferences (3 vertical dots) may be in the upper right or in the lower middle of the screen – depending on which Android phone/device you are using. Or you might need to tap the menu button on the phone itself, not on the screen. 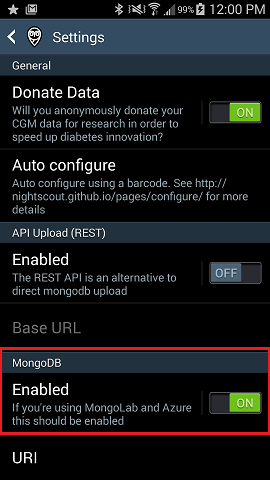 To configure MongoDB upload: Ensure that “Enabled” below “MongoDB” is ON. In the pop-up screen, MANUALLY TYPE IN the MongoDB URI you wrote onto the worksheet. DOUBLE CHECK THAT IT IS 100% ACCURATE. Any mistakes will prevent the system from working. **IT IS ALMOST ALWAYS A MISTAKE IN THIS STEP THAT WILL PREVENT YOU FROM CONNECTING. Click OK when you are finished. Leave Collection Name “entries” as-is. 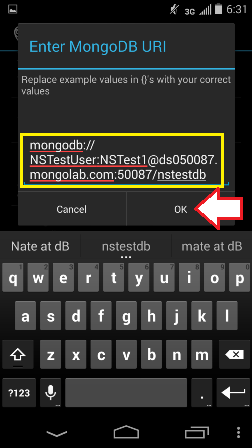 Note: If you used a custom Collection Name in your Mongo setup, then tap Collection Name and type in your custom name in the pop-up screen. This is not the recommended setup method. Leave Device Status Collection Name “devicestatus” as-is. 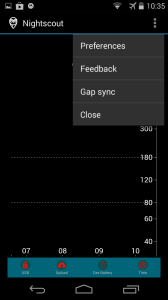 This is for storing battery data of the uploader app phone and should NOT be changed. You can also use the auto configure tool to ensure that a correctly formatted URI string is entered into the uploader app.